In-house programs and walking tours without the hills and steps! or e-mail onthelevelsf@hotmail.com for the latest offerings. These short level walks of San Francisco neighborhoods and parks work for everyone, including those using wheelchairs. 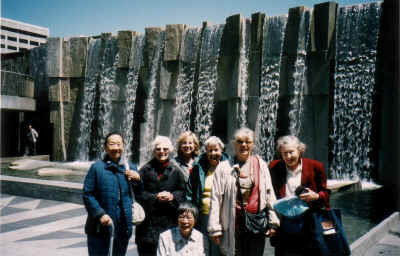 The walks and tours can be customized for your group. What’s New and Fun in San Francisco? Participants say: "Marilyn's tours are thoughtful and imaginative, they will open your eye's to the city's hidden riches" "...very interactive and fun." You furnish transportation to the starting point of the walks. "When can you come back?" "This is the best program we've ever had!" Reserve your In-House program at (415) 921-1382. Cost: $125 honorarium requested but a sliding scale is available based on your ability to pay. This program combines a guided walking tour with a specific restaurant for lunch or dinner following the tour. Another option lets participants shop and eat on their own following the tour (this has worked very well for several groups who toured Pacific Heights or Cow Hollow followed by shopping and eating on Fillmore St. or Union St.). Click here to learn about Cow Hollow. Call Marilyn Straka to discuss specifics and to book your tour at (415) 921-1382. Have a time slot on your calendar to fill and need an idea? On The Level will plan a trip to a museum (Musee Mechanique is free entry, for example); a nature walk at a preserve (Coyote Hills, for example, has a boardwalk to accommodate all types of walkers or wheelers); or a holiday-specific tour (a Valentine's Day treasure hunt to find hearts, for example). Call Marilyn Straka at (415) 921-1382 to discuss your specific need. Click here for a list of available tour booklets and order information. Consider the website special offer that includes all seven booklets so that you have a reference set available for your Activity Coordinator. For those times when you need to fill a program space because of a last-minute cancellation, order a number of Pacific Heights West self-guided walking tour booklets (enough for the average number of program participants) and we'll include a suggested program for a "virtual" walking tour from the booklet (such as highlighting homes of the rich and famous) and ideas about how to make your own program fun and interactive! Mention "Do-it-yourself" when you submit your order. Click here to learn about Pacific Heights West. Order all seven Self-guided Walking Tour Booklets bound in a convenient folder so that the booklets can be checked out as a set or as individual walking tours. Order the website special of all seven walks and mention "Library copy" to receive the free binding for the booklets. Click here for a list of available tour booklets and order information. Flyers are available for posting on your common-area bulletin board. Individuals can order their own Self-Guided Walking Tour Booklets or they can book their own custom Guided Walking Tour with Marilyn Straka as their personal guide. Call Marilyn Straka at (415) 921-1382 and leave your name and address to have full-color Self-Guided Walking Tour and Guided Walking Tour flyers sent to you.